Pune-based Function Space Labs Pvt Ltd, which provides a collaboration and learning network for students, researchers and enthusiasts in Mathematics, Physics and other sciences, has closed a seed round of funding from Nexus Venture Partners. The funding will help the company expand content and develop engaging tools as well as scale its contributor and user base. A part of the capital will also be used to build a stronger foundation of collaboration tools appropriate for the science communities and to attract additional experts to the site. As part of the deal, Sandeep Singhal, co-founder & MD of Nexus Venture Partners will be joining the board of Function Space. "Function Space serves a crying need to make Mathematics and Sciences fun and engaging. We are thrilled to work with the founding team that is committed to exposing the beauty and usefulness of STEM (Science, Technology and Mathematics) to experts and non-experts alike," said Naren Gupta, co-founder & MD, Nexus Venture Partners. "We hope to see a platform, where researchers can discuss advanced topics and enthusiasts can be exposed to a collection of traditional as well as emerging knowledge in STEM," he added. 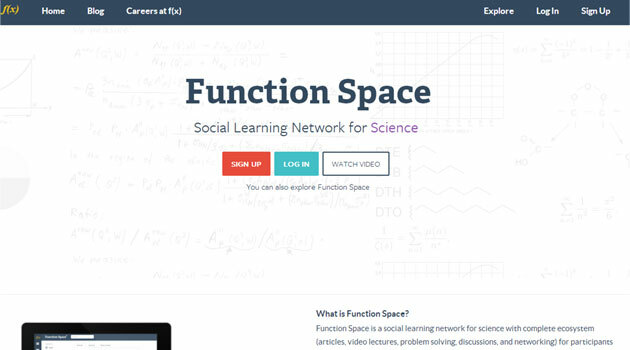 Function Space was founded last year by Adit Gupta, Sakshi Majmudar and Sumit Maniyar with the idea of creating a complete ecosystem for learning higher science online. The team has strong backgrounds in technology and design. Gupta had previously worked at Sourcebits LLC and Verchaska Infotech, while Sakshi had worked at TCS and InfoBeans. The third co-founder Maniyar had worked at Religare and JP Morgan prior to setting up the e-learning venture. It is a social learning network for science with a complete ecosystem (articles, video lectures, problem solving, discussions and networking) for participants from academia to corporate research. Function Space claims that it offers a strong community consisting of users from over 190 countries, including students, professors and researchers from MIT, Stanford University and University of California campuses, IIT campuses, Indian Institute of Science and other prestigious institutions. "Nexus Venture Partners shared our vision of building a one-stop solution for science. Their strong team coupled with Indo-US presence gives Function Space a major opportunity for rapid global expansion," Adit Gupta, founder of Function Space, said. This is Nexus Venture's sixth known investment since January 1. In April, the VC firm led a $9 million funding round in California-based ElasticBox Inc, which enables developers and enterprises to create, deploy and manage their applications. A month earlier, Nexus Venture co-led an $8.5 million funding round in Indix Corporation, a SaaS and Big Data product intelligence platform. In February, Nexus participated along with eBay in a $133.77 million funding round in online marketplace Snapdeal.com. In the same month, it invested in US-based Kaltura Inc. Previously, the VC firm put in an undisclosed amount in Pune- and Florida-based Uniken Inc, an enterprise security solutions firm.